Varun's informal music initiation began at a very early age through listening and he exhibited the ability to recognize ragas at a very young age. Under the auspices of Perambur Sangeetha Sabha in Chennai, Varun gave a performance of raga recognition on Jan 26, 1995 (age of 2). Varun's formal music education began in Oct 1997 under the guidance of Smt. Vani Sateesh, New Jersey. He later continued his music education in 2007 under Sri Ashvin Bhogendra (NJ). Varun is currently under the tutelage of Sangeetha Kala Acharya Sri P.S. Narayanaswamy and his disciple, Sri A.S. Murali (Chennai). He is blessed to have received advanced training from Sri Neyveli Santhanagopalan and the teachers of the Yuva Sangeetha Lahari organization in New Jersey. 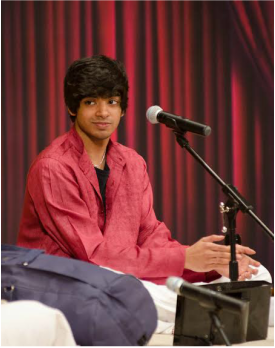 Over the past six years, Varun has had opportunities to sing at many venues in the USA. In addition, he has won several Carnatic music competitions in the United States, the most notable of which are Advanced category competition in CMANA GCD 2007, Concert Competition at CTF 2009, and Advanced Pallavi Competition at CTF 2013. He also was awarded first runner up in the second season of CMI USA (2012). Varun has also performed in the Chennai December music season at various venues/sabhas including Narada Gana Sabha, Braham Gana Sabha Trust, Karthik Fine Arts, and Asthika Samajam. Varun is a recent graduate of MIT (Massachusetts Institute of Technology) with a double degree in Computer Science and Mathematics and works at a Proprietary Trading Firm, Five Rings Capital, in New York City.